If you find yourself in Leamouth in the East End’s Tower Hamlets area, you will be able to see the last remaining lighthouse still standing in London. 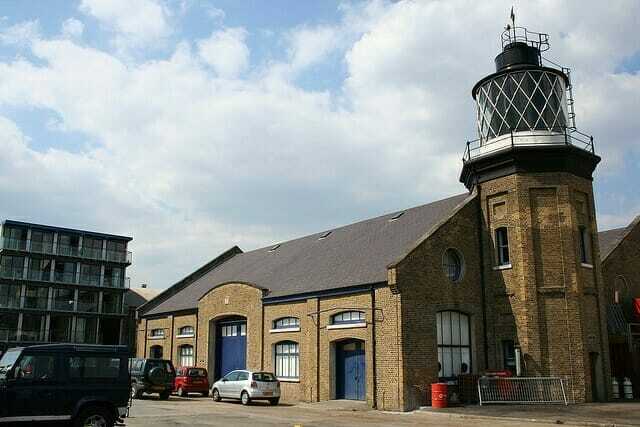 Also known as Bow Creek lighthouse, the wharf buildings around the lighthouse are now used as an arts centre and creative work space, which is open to visitors. The lighthouse itself is no longer in use, but gives visitors a slice of London’s history in an unusual setting. The wharf was originally set up by the Corporation of Trinity House. This was a membership group of mariners and shipmen, dating back to Tudor times. In 1514, Henry VIII gave the group an official charter, and the corporation earned its own coat of arms in 1573. At this point it had the right to install and look after “beacons, marks and signs of the sea”. Its primary business was making navigation on the Thames and in local sea and waterways safer and easier. The corporation was based in the City of London, but started using this wharf area as its waterside workshop in the early 1800s. It made and maintained buoys and sea marks in its workshops, and the site was also used for storage and as a base for the corporation’s boat. This was used to set out its buoys and to access them when they needed dockside repair or maintenance. The wharf was also used by lightships when they needed repairs or somewhere to dock. During the nineteenth century, the corporation developed this site further and you can still see some of the original structures and building at the wharf. The river wall itself around the wharf dates back to 1822 and the Electrician’s Building to 1836. The Chief Engineer of the corporation, James Walker, also started to build the wharf’s lighthouses. The last remaining one that still stands today was built after his time, however, by the then Chief Engineer, James Douglass. Douglass’s lighthouse was constructed in 1864. Known as the “Experimental Lighthouse”, this was used to train lighthouse keepers and to test lighting equipment and devices before they would be used in working lighthouses around the country. The roof area next to the lighthouse is an odd area of interest, but it was in this spot that the scientist Michael Faraday had a workshop. Faraday had a long-standing interest in lighthouses and in avoiding corrosion on ships. It was on this spot that he started experimenting in how to use electric lighting in lighthouses. By the 1860s, wooden buoys were being replaced by iron ones, and the corporation started an engineering department where it could test and repair these new models. At this point, space became a real issue, and the corporation took over a neighbouring shipyard to give its works more space. This allowed it to employ around 150 employers by the early 1900s, including engineers, carpenters, testers, blacksmiths and labourers. At this time, the corporation primarily looked after buoys and lightships between Suffolk and Kent, but its best days were behind it. Despite modernisation projects that ran right up to the 1960s, it closed in 1988. The site was taken over by the London Docklands Development Corporation, but it took almost another ten years before Trinity Wharf started its new life under the management of Urban Space Management. Trinity Buoy Wharf is now an arts centre and creative community hub, described as the most exciting arts quarter in the Docklands area of London. You can still see some of the original wharf buildings, and two old lightships are still docked at the wharf, giving visitors a sense of the wharf’s history. The wharf is also home to Container City. This is a collection of old shipping containers, which have been put together to create innovative, colourful and environmentally friendly work units and space. The venue is popular with visitors. From a creative perspective, it houses studios, galleries and rehearsal rooms, and has various eating options and entertainment venues on site. You can enjoy lunch in an authentic American diner, or in a converted shipping container if you prefer! The centre has a range of permanent exhibits and installations, many of which are in keeping with the area’s maritime history, and runs regular temporary exhibits and events. Permanent installations include a Street Art Train and Sculpture Park. You can also visit an installation dedicated to Michael Faraday who conducted many of his experiments on the site. This installation covers his life and times and has some interesting interactive features to keep the kids happy. If you have any potential freerunning enthusiasts in your family, you can also visit the wharf’s Parkour Academy and get some expert tips and advice. I read the information about this area of London; I ‘ d like to spend a short time there; more precisely, I’d really like to get to the lighthouse. I even tried last year, but it was very difficult and finally I surrendered. cCan you please tell me the best way to get from Marble Arch area? I would rather use buses and overground instead of underground trains.